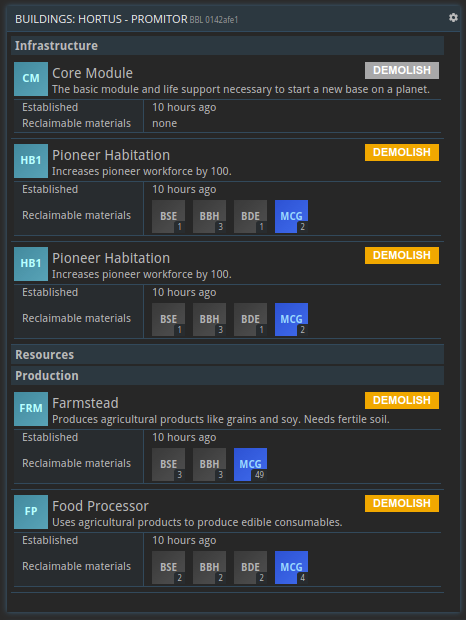 Hardly any feature has been requested more frequently than getting back resources for demolishing buildings, except maybe a second confirmation button for certain actions. Good news: Both are coming very soon! If demolished within 1 hour of construction, all materials are reclaimed. Afterwards only a fraction is returned that corresponds linearly with the age of the building. After 60 days the building is written off and no materials can be reclaimed. All old buildings will be handled as if built on March 28th 2019, so everyone gets a change to restructure their bases. 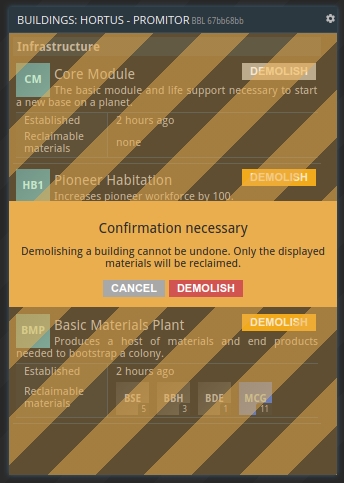 It won’t be possible to demolish the core module. Right now building demolition is the only place we use it, but it could be used in many other places: starting/aborting flights, creating production orders that will run for longer than a certain amount of time and so on! Let us know which action buttons need fatfinger protection! This week, I continued communicating with different parties concerning press coverage and sponsorship opportunities, which is probably pretty boring to read about. Slightly more exciting: I planned and mocked up a dedicated page for big future updates. Each update will get its own cool name and sub-page on our website to showcase the new features it introduces. However, most of my time this week was spent on something I can’t tell you just yet. The good news is that you’ll it see tomorrow! I continued toiling away on my data loading issue I talked about in devlog #174. It’s a bit more framework-building than I had hoped, but the basics are pretty much done and after going over the changes with Michi next week, I hope to be able to roll them out to the first parts of the application. 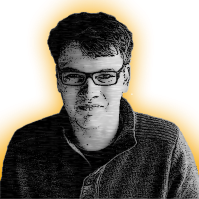 From the get-go, the goal was to be able to apply this refactoring continuously and not in a single huge update. So whenever we add new functionality or have to touch existing ones, we can just move them over to the new system, leaving everything else untouched.